TopRank® Marketing was established in 2001 and under the leadership of co-founders Susan Misukanis and Lee Odden, has earned a reputation as a first-choice digital marketing agency for major brands including McKesson, Dell and LinkedIn. We also serve many other companies in the B2B technology, healthcare and services industries as well as B2C companies operating online. With a talented team of smart, creative and results-focused digital marketing professionals, TopRank Marketing has developed insights and methodologies for tackling the most challenging digital marketing and PR challenges. In addition to a smart and creative approach to getting marketing results for our clients, we’re fun to work with! TopRank Marketing clients are served by Account Teams consisting of an Account Manager, Account Coordinator and service area specialists in digital marketing strategy, research and planning, copywriting, front end web design / development, content development, public and media relations, paid search advertising, paid social media advertising, email marketing, digital marketing analytics and report. A recognized thought leader, TopRank Marketing publishes Online Marketing Blog, ranked one of the leading and most influential marketing blogs on the web by Content Marketing Institute, Advertising Age, Edelman’s Social Media Index, Onalytica’s List of Most Influential PR Blogs and many others. TopRank team members have also been involved with creating content for the basic and advanced programs of the first SEO Certification Program conducted by an industry association. TopRank staff also attend multiple local and industry marketing conferences each year and numerous team members are certified on Google Analytics and Google Advertising. 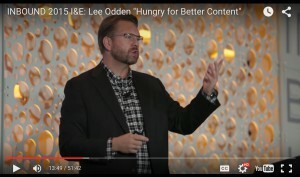 TopRank Marketing’s CEO Lee Odden is a sought after industry thought leader who is regularly called on to keynote or present on the topics of digital marketing and PR, content marketing, SEO and social media marketing at industry events all over the world.